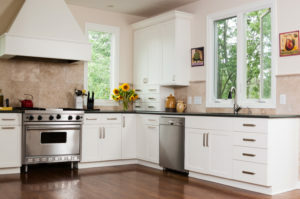 -Give your kitchen cabinets a good cleaning at least once a year to keep grime from building up. Try using liquid dish soap to attack greasy spots. -Get stains out of solid surfacing with baking soda. Mix it with just enough water to form a paste and apply with a sponge. -Make cleaning the microwave easy. Put a solution of one cup of vinegar and one cup of water into a microwave safe dish and heat it for three to five minutes. The steam will loosen the dirt so you can simply wipe it out. -Get a shiny, clean floor by mopping it with one part white vinegar to nine parts water. -Use ketchup to remove tarnish from brass and copper fixtures. Apply it with a soft cloth, rub gently, and rinse with warm water. -Let the blender clean itself. As soon as you’re done pouring your smoothie or shake, fill the blender pitcher with warm water and a drop of dish soap. Put it back on the blender base and turn it on for about thirty seconds, then rinse and dry. -To clean cast iron pans, use a paper towel to scrub them with salt and a little bit of oil. -Put your coffee maker carafe in the dishwasher weekly to keep brown stains from accumulating. Run a mixture of equal parts of vinegar and water through the maker to clean the inside of the machine. Sometimes, appliances and fixtures may simply be so old or worn out that they won’t come clean anymore. Green’s Plumbing is happy to help you replace them and get the kitchen of your dreams. Just give us a call at (818) 880-8847.